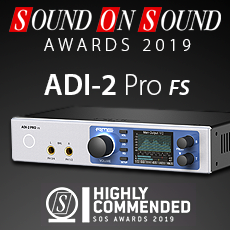 The RME ADI-2 Pro FS wins the Highly Commended Award in the ‘Best New Computer Audio Interface’ category. The winners are voted for by readers of the magazine, with nominations chosen from the products with the strongest reviews of the past 12 months. Big thanks to Sound On Sound, and to everyone who voted and continues to support RME! We are excited to show new RME products at IBC 2018 (booth 8.D70). The show will take place at RAI Amsterdam from September, 14th - 18th 2018. At a special event in Japan RME gave a preview of new converters that meet the requirements of today’s productions and installations that need high analog channel counts. The mobile audio interface is based on the AVB standard (Audio Video Bridging) and enables the transmission of up to 256 network audio channels between a Windows computer and other AVB devices within an audio Gigabit network via a single USB 3.0 cable. 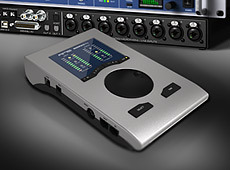 The mobile audio interface enables the transmission of up to 64 Dante channels and 64 MADI channels via a single USB 3.0 connection. 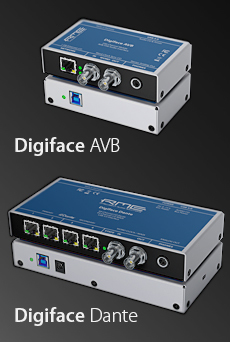 With the new Digiface Dante RME extends its Digiface series with a powerful Dante model for USB and standalone operation. 02/2018 The Dynamic Duo is back! Announced at NAMM, TotalMix FX 1.50 and his ward TotalMix Remote are now available in the RME Forum as public beta, to try them out. The Duo offers a rapid, punchy and smart remote control via network - no matter if Ethernet or WiFi. The remote control is realized by the new program TotalMix Remote, which is nearly identical to TotalMix FX in features and design. However, there is no communication to a local interface, but via network to all systems running TotalMix FX version 1.50. The software will be available free of charge for Windows, Mac OS and iOS (iPad). The update to version 1.50 of the normal desktop version is (of course) also free. In 2016 RME released the ADI-2 Pro. With a lot of fresh ideas, innovative features and numerous useful functions it rolled up the AD/DA converter scene and quickly became a reference for both AD- and DA conversion. To better address the home and HiFi users, RME exchanged some of the Pro's studio features with typical home and HiFi ones. With an adapted feature set and much simplified operation RME proudly presents the ADI-2 DAC. 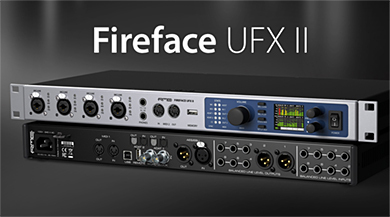 The unique Fireface UFX II is the premier solution to transfer analog and digital audio data directly to a computer from practically any source. Numerous unique features, well thought-out configuration dialogs, an industry-leading mixing engine and monitoring solution, professional DSP effects and class-leading analog circuits with latest digital converters put the Fireface UFX II at the very top of the range of computer-based audio interfaces. This compact, portable and lightweight audio interface (only 220 g /0.49 lbs) transfers digital audio data in SPDIF and ADAT format to Windows and Mac computers. The latest Plug and Play technology guarantees a simple installation, even for the inexperienced user. 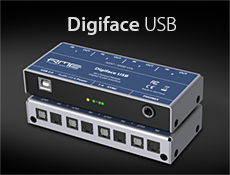 Numerous unique features as well as RME's robust drivers enable a quick, efficient and comfortable operation of the Digiface USB. 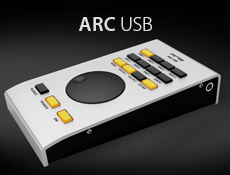 The ARC USB makes a terrific companion to the recently introduced Fireface UFX+ audio interface and the company’s acclaimed TotalMix FX routing and mixing software. Equally notable, the ARC USB works with any RME audio interface that is currently compatible to the latest drivers supporting TotalMix FX, and this includes interfaces that were released as far back as 2001. With an abundance of useful features, this Advanced Remote Control (ARC) offers intuitive control over the interface’s DSP-based routing and effects section. The ADI-Pro is a truly high performance AD/DA converter, USB 2.0 DAC, USB 2.0 class compliant interface and high-end headphone amplifier from RME. It’s unparalleled specifications and features deliver crystal transparency and a professional performance that makes it the right choice for mastering and measurement applications as well as the ultimate tool for audiophiles everywhere. 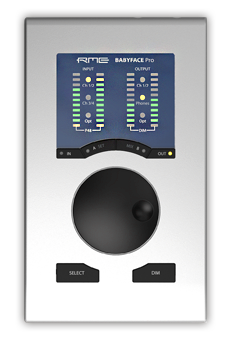 The RME MADIface Pro is a variation of the well established Babyface Pro audio interface. The MADIface Pro includes the original high-end 4 x analogue inputs (Mic, Line, Instrument) and 4 x analogue outputs (2 x XLR, 2 x headphones) found on the Babyface Pro, but the 8 I/O ADAT has now been replaced with 64 channels of MADI I/O, giving you a staggering 68 channels of I/O. 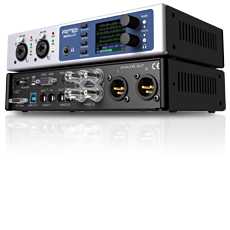 The RME Fireface UFX+ once again raises the standards of professional performance. This robust and beautifully designed 1U interface is fully Thunderbolt and USB 3 compatible with PCI Express audio performance under both Mac and Windows. The Fireface UFX+ offers a staggering 188 channels of I/O over analogue, ADAT, MADI, AES and SPDIF. The new optional ARC (Advanced Remote Control) USB is also available for the Fireface UFX+. The latest version of TotalMix FX for iPad 1.30 is now available on the App Store. While the new version no longer supports the original (first) iPad, it runs perfectly well from iPad 2 to the latest iPad Pro. Version 1.30 adds support for iOS 9 and the iPad Pro. It is compiled for 64 bit operation, supports slide over and split view, and enables the full resolution on the iPad Pro. Version 1.30 also adds the options ‚Loopback’ and ‚EQ for record’ with Babyface and Babyface Pro. As usual the newer version also includes some small bug fixes and performance improvements. 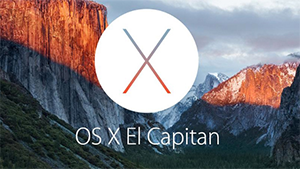 Due to the big number of incoming questions about compatibility of RME audio interfaces to Apple’s latest Mac OS X 10.11, also known as El Capitan, RME would like to point out that RME drivers work without known issues under 10.11 as well as 10.11.1. Also note that RME did not have to change or modify drivers for El Capitan, which is a statement in itself on RME’s code quality and driver design. RME FireWire interfaces are also fully supported and continue to work with 10.11 and upcoming OS versions. There has been some confusion generated by Apple no longer supporting their own FireWire Core Audio driver, causing some well-known audio interfaces which relied on this driver to be no longer supported from 10.11. on. RME is not affected by Apple’s decision as RME develops their own drivers for all devices, and FireWire as such is and will stay supported from the operating system in the foreseeable future. 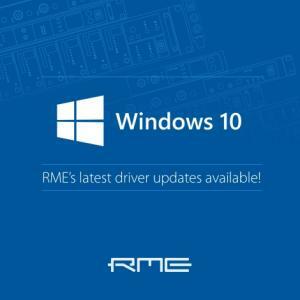 08/2015 Are RME interfaces ready for Windows 10 ? 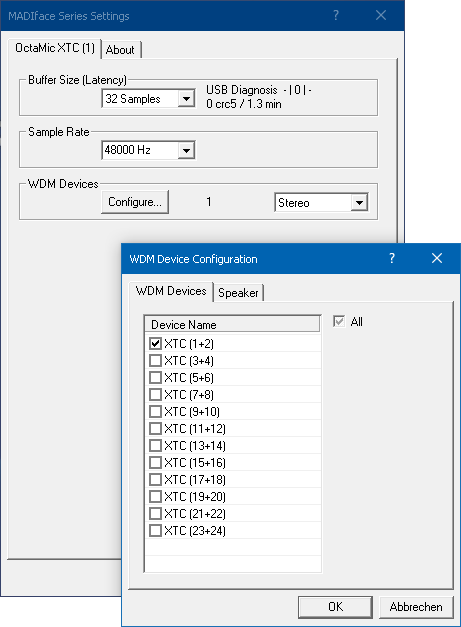 The simple answer is Yes, RME have tested driver compatibility with the new Windows operating system and as you would expect, all audio interfaces are working correctly. And by the way, that includes interfaces such as the Multiface released back in 2001. To make sure that you have the latest drivers for your interface, go to the RME download page. 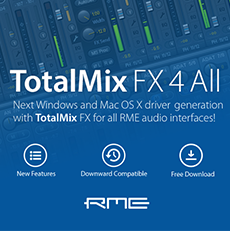 10/2014 RME presents: The next Windows and Mac OS X driver generation with TotalMix FX for ALL RME audio interfaces! Level 1: A new PCI/PCIe Windows driver (4.x) offers outstanding new features for WDM operation under Windows 7 and 8. Level 2: FireWire and USB drivers updated with new features and slightly improved performance, under both Windows and Mac OS X.
Divine level 3: All new drivers now include TotalMix FX also for all older interfaces. Yes, RME ported the latest TotalMix FX back to all devices released since 2001! To repeat and clarify: Now TotalMix FX replaces the old TotalMix on all RME HDSP(e) cards, as well as the legendary FireWire audio interfaces Fireface 800 and Fireface 400. 04/2014 Brand new MADI Router starts shipping! The MADI Router is a compact device designed to link MADI devices of any manufacturer with unprecedented flexibility in signal routing. It provides this flexibility by serving as a format converter between optical and electrical signals, as a signal repeater, and as a distributor and merger of several MADI signals, all at the same time... and it's available now!!! 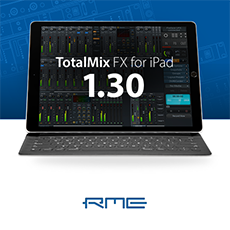 'TotalMix FX for iPad' is RME's Windows/Mac software TotalMix FX ported to iOS. It gives control over the mixer and effects of the supported audio interfaces Fireface UCX, UFX and Babyface when these devices are in Class Compliant mode. TotalMix for iPad does not work wirelessly, and is no replacement for typical remote software (like Lemur / TouchOSC). 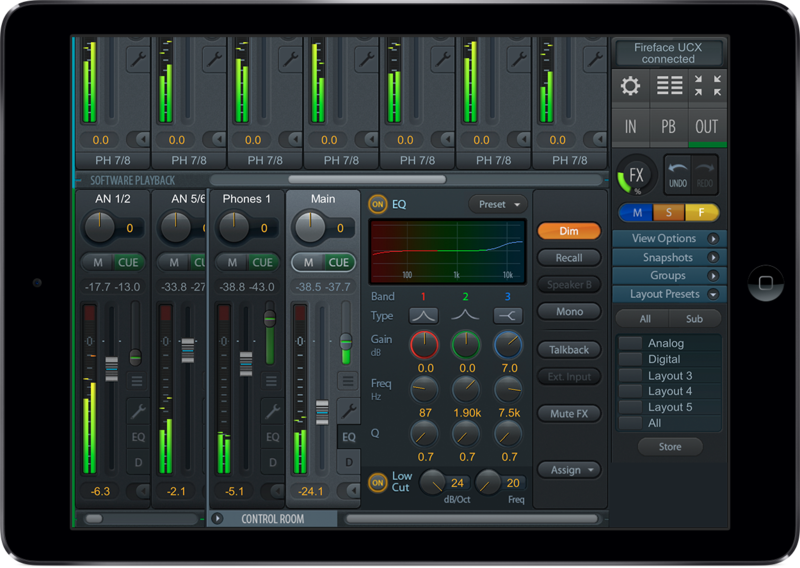 TotalMix FX for iPad runs on any iPad and iOS version 5.0 up, using only few resources. 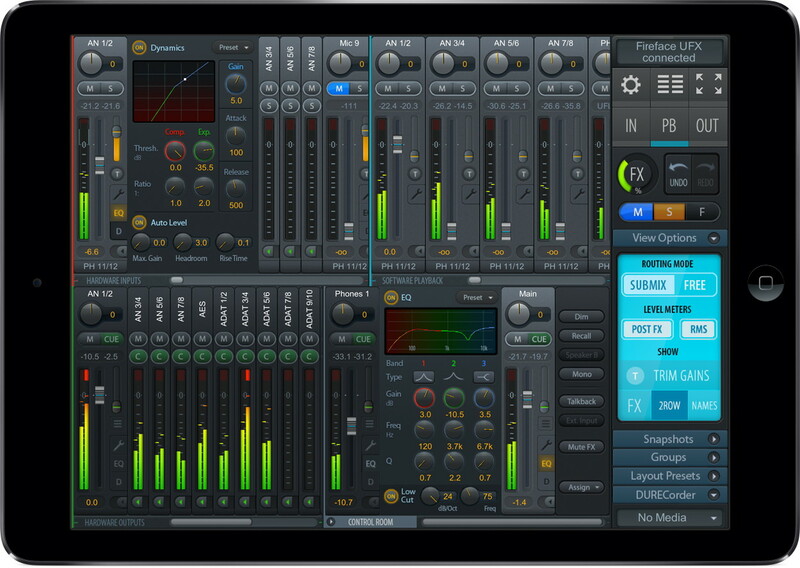 'TotalMix FX for iPad' is RME's Windows/Mac software TotalMix FX ported to iOS. It gives control over the mixer and effects of the supported audio interfaces Fireface UCX and Fireface UFX, when these devices are in Class Compliant mode. TotalMix for iPad does not work wirelessly, and is no replacement for typical remote software (like Lemur / TouchOSC). 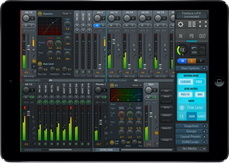 TotalMix FX for iPad runs on any iPad and iOS version 5.0 up, using only low resources. RME's MADIface XT is the world's first USB3 audio interface - and the world's smallest portable interface that provides access to hundreds of audio channels in such a small package. For highest usability and connectivity the XT can also be used with USB 2.0 (computer I/O limited to 70 channels). Its unique PCI Express port connects to External PCI Express cards as well as adapters to Thunderbolt, providing all the fastest interfacing technologies available for maximum channel count and lowest latency in one unit. 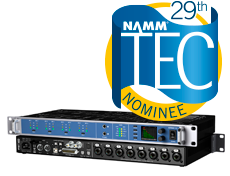 RME OctaMic XTC has been nominated for a 29th Annual Technical Excellence & Creativity (TEC) Award in the category of Microphone Preamplifier Technology. The TEC Awards was established in 1985 to honor outstanding achievement in professional audio production and product innovation. Voting will take place in December. The MADIface USB is a compact device that provides MADI I/O via USB 2.0 while supporting the format's full 64 channels. Its sturdy and bus-powered design makes it as easy to use and reliable in your application. The MADIface USB is therefore both MADI portability at its best and a perfect desktop solution to connect MADI equipment to any Mac and PC. 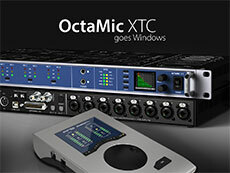 RME proudly presents a new generation of microphone, line and instrument preamp, A/D converter, digital patchbay and format converter, monitoring device and even a flexible frontend for the iPad® - the OctaMic XTC! 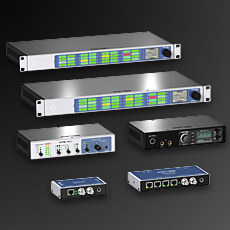 With the OctaMic XTC eight microphone and line inputs, 4 switchable to Hi-Z mode, meet an unrivaled variety of digital connection protocols - from common ADAT and AES/EBU to sophisticated 64-channel MADI optical. This year, RME introduces a whole new range of products: the world's first USB3 audio interface, an extremely flexible hi-end preamp/converter, the smallest portable MADI USB solution ever, 3 new MADI routers and 2 new MADI converters - all in a striking new design. 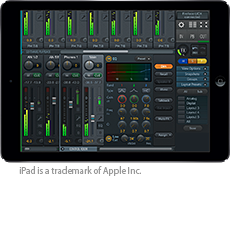 Which is also true for the updated TotalMix FX with its fresh new design and new features - shown as iPad app for the very first time. This year at NAMM the RME Fireface UCX won the Rock oN Tech Award for its superior technology. 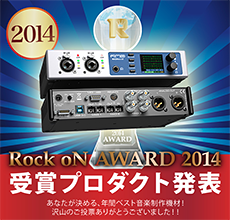 From 17th of December 2012 until the 9th of January 2013, Rock oN Company from Japan asked their customers - which are mainly professional musicians and sound engineers - to vote for their product of the yearin nine different categories. 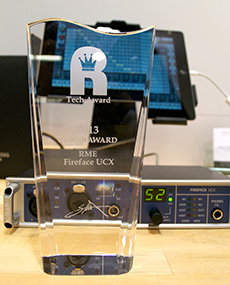 The RME Fireface UCX won the category "Tech Award" based on its superior high level of technology. This includes the professional implementation and ease of use of the Class Compliant mode, driver stability, Steady Clock and much more. Being an early adopter and pioneer in MADI technology, RME developers have always been dedicated to making the open protocol compatible, stable, and affordable for their customers. Among the first devices that were released for the widely adopted technology were the ADAT and AES3 (in Europe also known as AES/EBU) converters ADI-642, ADI-6432, and ADI-648, as well as the MADI Bridge and MADI Converter, which have gained a reputation of being unmatched in terms of feature set and reliability in over a decade. RME thus made MADI more popular than any other manufacturer. This year, RME updates the digital MADI converters of their Premium Line, announcing five new products in a striking new design, which are presented at the NAMM show: the new MADI Router, the ADAT Router and ADAT Converter, and the AES3 Router and AES3 Converter. One year ago at NAMM RME announced the Fireface UCX. One of the reasons it draw so much attention was the included Class Compliant mode, which turned the UCX into the world's first professional audio interface for Apple's iPad™. Now that Apple officially allows multichannel playback (since iOS 6), the latest iPads got more powerful, and more and more apps support more than 8 channels (or at least have announced to do so soon), RME extends the 8 channel CC mode of the UCX to all existing 18 channels by firmware 220/4. The UCX SPDIF and ADAT I/O can now also be used without limitations. 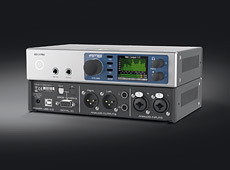 RME surprises with an unconventional move, updating its two-year-old portable USB interface with two exciting new features: full USB Audio 2.0 Class Compliance for connection to the iPad™ and a stand-alone mode. The update is free of charge and can be done by the user with a simple firmware update via USB. RME already released the new firmware, which adds these two new modes to the unit. From now on the small yet ‘pro’ interface becomes a real all-rounder in both flexibility and features. 09/01/2012 RME HDSPe MADI FX starts shipping. The new HDSPe MADI FX is now available. The 390-channel PCI express card marks a new milestone in the history of audio interfaces. Such a high performance multi-track system and advanced MADI router has never existed before! 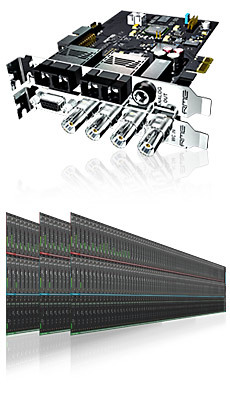 Three MADI I/Os - two optical and one coaxial - one AES/EBU I/O and one analog monitoring output. Plus Word Clock connection and four MIDI I/Os. A third optical MADI I/O is optionally available. To guarantee RME's unique low latency performance the card introduces a newly developed modular Hammerfall Pro Audio Core. The core processes three times as many channels as before, but actually reduces the system load and enables ultra-low latencies down to 32 samples. The included high-end digital mixer not only uses the card as powerful MADI router, with separated level settings for each routing. The 192 kHz effects engine also provides numerous latency-free hardware effects like EQs, Compressors, Reverb, and Echo. State-of-the-art fail safe operation: the new RME PCI express flagship provides 64-channel recording with seamless redundancy. As soon as the current input fails, one of the other two inputs is used. Switching the inputs takes less than a sample. The new RME Fireface UCX gets the nomination for the best audio interface 2012 from the Resolution Magazine. 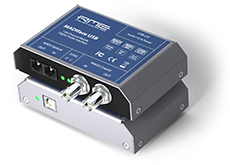 The RME Advanced Remote Control is an optional accessory to the Fireface UFX and Fireface UCX. The wired Advanced Remote Control (ARC) has been designed for direct access to the most frequently used actions and commands required in a studio's daily work. The ARC consists of a solid metal case with a main encoder dial and 8 push buttons, 6 of them equipped with LEDs. Seven buttons can be freely assigned via TotalMix FX to more than 36 different commands. The Advanced Remote Control (ARC) can be used with the Fireface UCX. It can also be used with all Fireface UFX with a serial number 23241707 (built after June 2011) or higher. 03/15/2012 RME announces the Fireface UCX standard edition. RME announces that starting April 2012 the successful Fireface UCX will be shipped without the previously included Basic Remote Control, and therefore at a lower price. Users can choose the new and powerful Advanced Remote Control as a perfect addition to the Fireface UCX (as well as the Fireface UFX). The Advanced Remote with six more programmable buttons is sold separately. The Remote Control Edition of the Fireface UCX will be available until the Standard edition starts shipping. 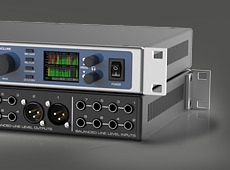 01/15/2012 The new RME high-end audio interface starts shipping. The 36-channel USB&FireWire audio interface is not just a smaller version of the award winning UFX, including HFX-Core and the complete 192 kHz effects engine. The UCX continues the tradition of RME's tremendously successful compact interfaces, and combines it with the great usability of the successful Babyface through the included remote control. On top of it: the UCX is the perfect partner for every Apple iPadTM! 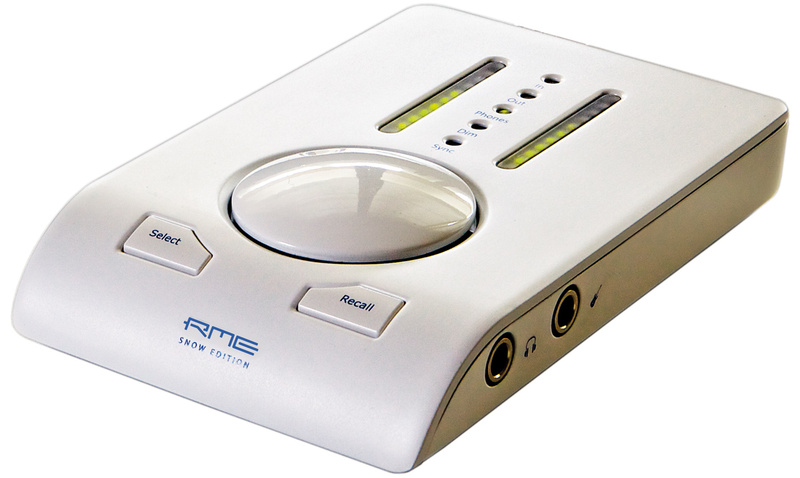 The Snow Edition is a special edition of the Babyface, RME's highly successful USB audio interface. It is strictly limited to 1500 units worldwide, and will be available only for a short time around christmas 2011. The Snow Edition is basically fully identical to the standard blue and silver versions of the Babyface. The Snow Edition shines with a snow-white solid metal case. A glossy encoder knob and an elegant matte body, which appears like exclusive porcelain, enrich the valuable character of this extraordinary gadget. The Snow Edition's package includes a stylish, white leather carry bag and a white cable set. As a special bonus the Snow Edition adds a white Hi-Fi breakout cable with four unbalanced golden RCA connectors to the included black balanced breakout cable with XLR connectors. 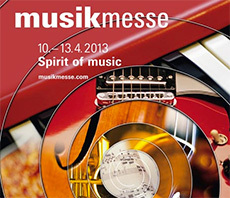 10/12/2011: RME distributor Audio AG donates 40.000 Euro to Help e.V. for recovery of business owners in Ayukawa after the earthquake disaster in Japan. In April 2011 Audio AG started to establish a help fund for the victims of the disaster in Japan. For a period of three months some of Audio AG customers donated 1% of their RME turnover to the fund raising project. Audio AG doubled the sum and round it up to 40.00o Euro. The donated money was transferred to the Help e. V. organization. Help's policy is "help to self-help". They are always cooperating with local partner organizations, because locals know their people, their culture and therefore the needs of the people better than any foreign expert. Partner for Japan project is JEN. The money for Audio AG's supported project is for reconstruction of the local business structures in the commercial Avenues in Ayukawa, Ishinomaki City. Business operators will be provided with basics like temporary buildings, necessary equipment and most basic store fixtures to allow them to proceed to smoothly re-start or start the business. This project is intended to give significant impact to the local economy of Ayukawa area, and is expected to lead to improvement in employment and living environment. 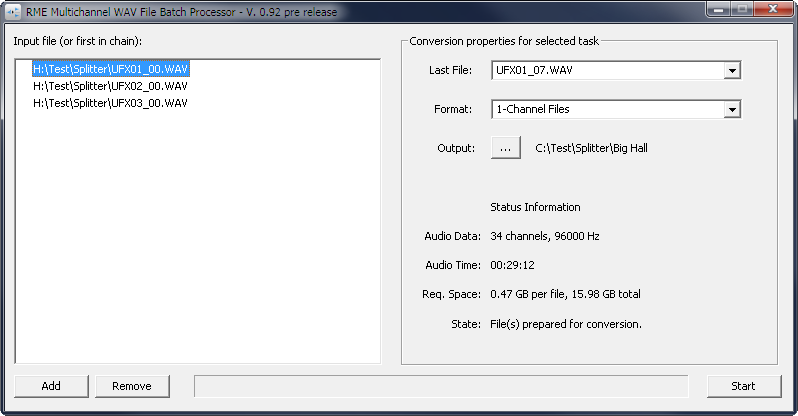 RME releases a free multi-channel wave file batch processor software that allows to process files generated by the Direct USB Recording (DURec) of the Fireface UFX. Most digital audio workstations can import multi-channel wav files generated by the UFX directly into their projects. The need for the special RME tool arises from the fact that standard wave files can not be bigger than 2 GB to be fully compatible. With higher track counts and longer recording times DURec therefore uses multiple consecutive files. Importing these into typical DAWs requires the user to adjust and align the content of each file to the previous one. The RME tool adds an easy way to combine and split multichannel interleaved files from the UFX into single or dual channel files. The content of consecutive files is automatically combined into a single file. In the rare case that these again exceed the 2 GB limit the tool automatically writes RF64 files. The Mac version can also write CAF (Core Audio Format) files. 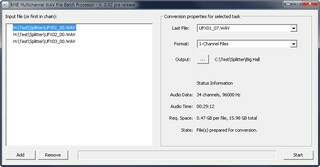 RME's Multichannel WAV File Batch Processor' can also perform multiple conversions of different recordings. Once all the single tasks are set up the software will process them one after the other automatically, hence 'batch processor'. The software is available for Windows and Mac OS X and can be downloaded and freely used from the RME website.